Scandanavian thrillers are all the rage right now thanks to Steig Larsson, but I’ve been a fan of this sub-genre since Peter Hoeg’s novel Smilla’s Sense of Snow and the original Norwegian version of the film Insomnia. Larsson’s Millenium trilogy may be the Hunger Games of its moment, but recently I discovered another Scandanavian author, from Finland, whose crime novels are much more to my taste. Jarrko Sipila is a novelist and crime reporter whose “Helsinki Homicide” series has just begun being translated into English. 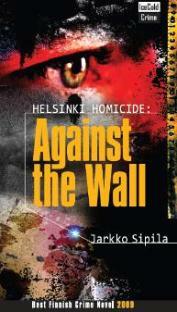 The first one, Against the Wall, won the 2009 award for Best Finnish Crime Novel. It details the investigation into the murder of a young hoodlum mixed up in customs fraud, and follows parallel paths as both the criminal underworld and the police force seek the motive behind the crime. It does something I love, best exemplified by the Michael Mann film Manhunter: it makes you hope that real cops are as smart, resourceful and tenacious as the ones in the story. The team under Lieutenant Kari Takamaki is unified by their dedication to duty, a Hawksian professionalism that needs no trite character justifications. These men and women do their job because it’s their job, and they get their satisfaction from doing it to the best of their abilities. This is what separates them from the criminals, who are equally smart and resourceful but prey to disloyalty, greed and complex bonds of loyalty and revenge. The cops win by essentially maneuvering the bad guys into tripping over their own worst tendencies. It’s a bit hard to evaluate Sipila’s style, since it’s translated to English from Finnish; apparently the only word the two languages share is “sauna.” He started as a journalist, so I imagine in his native Finnish his prose is punchy, succinct and vivid; if it’s a little clunky in English, I can live with that. I had no issue with one common criticism, the complex Finnish names, except where two very similar ones (Lindstrom and Lydman) were concerned. Still, the cleverness of the plotting, the broad strokes of character and the unique milieu come through just fine. And what connects with the reader is the universality of it all: criminals have the same motives in Helsinki that they do anywhere else, and cops want to catch them for the same reasons they do in New York or LA. Against the Wall is followed by Vengeance, which is near the top of my to-be-read pile. Hopefully more of the series will make it into English as well, because tough, honest crime novels are always welcome. Sipila’s novels in English are available directly from the Minneapolis publisher, Ice Cold Crime.